DC’s Young Animal imprint has been responsible for some of the most interesting, off-kilter superhero comics of the past two years, so it’s a pity to learn that the publisher will be shuttering the line in August with the conclusion of its current series. That said, 18 issues isn’t a bad run for these books, and the teams have built up concepts that are ripe for further exploration if the line returns in the future. Young Animal isn’t afraid to take risks, and its core series were creatively rejuvenated when they returned for second volumes that took the characters and ideas in bold new directions. Mother Panic became Mother Panic: Gotham A.D., sending Violet Paige to a future version of Gotham City that allows writer Jody Houser, artist Ibrahim Moustafa, colorist Jordan Boyd, and letterer John Workman to go even bigger and stranger with their interpretation of Batman’s home city. Violet’s entire world has changed, and she’s trying to put the pieces of her old life together while navigating this new urban landscape. A major part of that is finding her mentally ill mother, and this exclusive preview of this week’s Mother Panic: Gotham A.D #3 has the titular hero infiltrating one of the most dangerous places in Gotham as she follows a lead about her mom. Arkham Asylum may have been rebranded Arkham Institute, but there’s still darkness underneath its new public facade of holistic healing. 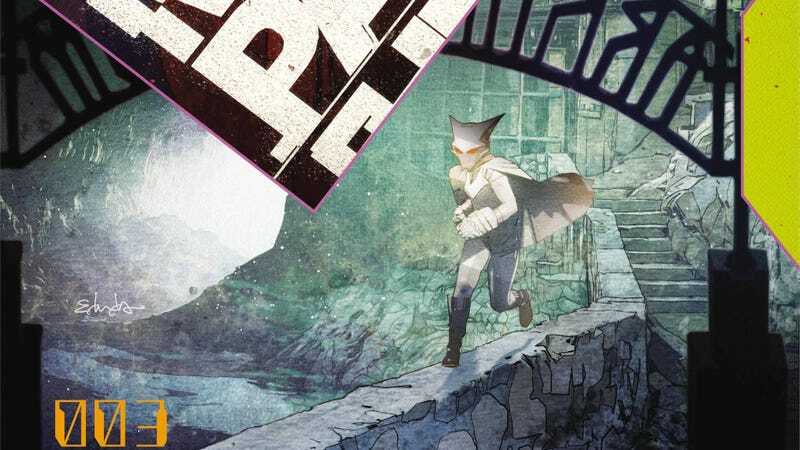 Moustafa and Boyd do exceptional work making Arkham Asylum a dank, foreboding setting in this excerpt, and Moustafa’s interpretation of Mother Panic has strength and swagger that gives the impression that she can handle anything that is thrown her way. Violet Paige is a flawed, complicated, and totally formidable urban crusader, and hopefully she’ll find her way into the central DC Universe once her solo series wraps up.